SpecificationsPavement Net Pasted Slate: 10x10cm, 30x30cm, 40x40cm, 60x60cm. with best quality and service. 1) Made of natural Slate:Mesh on the backside. For interior and Exterior Floor Covering. 4) Easy Installation:The productions we supply are with the mesh on the backside, when you get the finished productions, you can place them on the floor directly. 9) Payment term:T/T or L/C at sight. 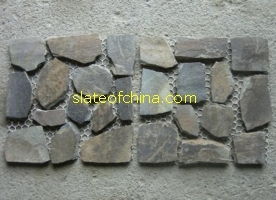 Suitable for wall and floor, you can choose different size and different goods with a mix order.We are waiting for your enquiry of the Pavement net pasted slate at any time.